Odin DVD Ripper is a powerful ripping software to enable you convert popular formats to play on your favorite multimedia devices so you can enjoy them at your fingertips! This professional dvd converter software can rip DVD movies to AVI, MPEG, WMV, DivX, MP4, H.264/MPEG-4 AVC, RM, MOV, XviD, 3GP, MP3, WMA, WAV, RA, M4A, AAC, AC3, and OGG formats, as well as rip DVD audio to MP3, WMA, AAC, and WAV formats. ...... devices! Rip those DVD movies to AVI, MPEG, WMV, DivX, MP4, H.264/MPEG-4 AVC, RM, MOV, XviD, 3GP, MP3, WMA, WAV, RA, M4A, AAC, AC3, and OGG formats. 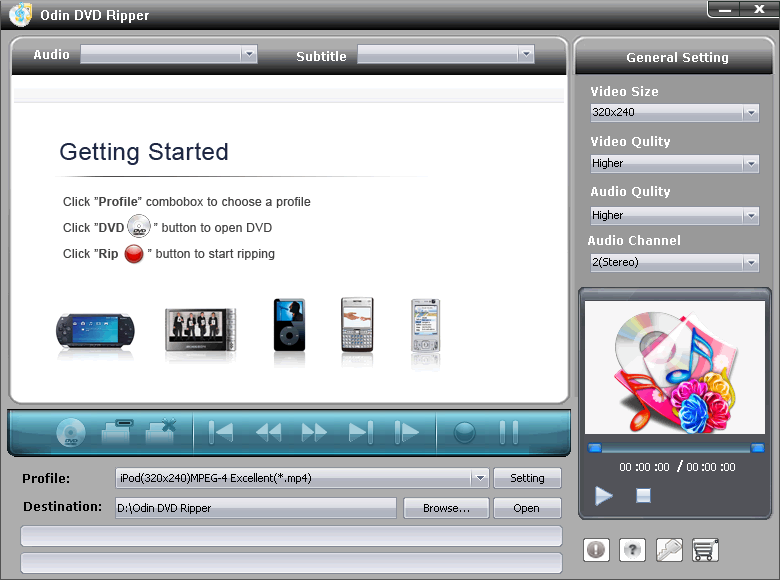 For you audiophiles with concert DVDs, you'll be pleased to know that you can rip DVD audio to MP3, WMA, AAC, and WAV formats.With Odin DVD Ripper, you can rip entire DVDs, or just selected tracks, with or without subtitles. You can also batch convert files so you don't have to be chained to your computer deep into the early morning hours. Advanced users will have loads of fun playing around with the bit rate, resolution, frame rate, sample rate, and codec until the output (handily seen in preview) looks just right. 1. Rip dvd movie to AVI, MPEG, WMV, DivX, MP4, H.264/AVC, MOV, XviD, 3GP, and Youtube FLV format. 2. Enjoy blu-ray dvd movies when convering. 3.Extract audio from blu ray movie,supported audio format: MP3, WMA, AAC, WAV, OGG, FLAC, APE, M4A, RA, AC3, MP2, AIFF, AMR, SUN AU. Qweas is providing links to Odin DVD Ripper 2.0 as a courtesy, and makes no representations regarding Odin DVD Ripper or any other applications or any information related thereto. Any questions, complaints or claims regarding this application Odin DVD Ripper 2.0 must be directed to the appropriate software vendor. You may click the publisher link of Odin DVD Ripper on the top of this page to get more details about the vendor.